Professor Iain Stewart travels to geologically significant locations around the world such as the Sahara desert, the West African coast, a crystal cave in Mexico, sink holes in the Iranian desert, Iceland, the Indian monsoon and a salt glacier to examine how geological forces have played a role in the rise and fall of various civilisations. The various episodes look at such phenomena as volcanoes and earthquakes and the forces of the wind and how these natural forces and events have affected the development of commerce and trade. Professor Iain Stewart examines the distribution of water and the use of irrigation as well as and fire, oil, and the industrial revolution. Some of the commentary such as why fault lines cause earthquakes is fairly straight forward, however, some of the segments are unexpected and visually stunning such as the crystal caves in Mexico and the living bridge in the Himalayas. The Blu Ray images are superb. Not only are the depth and clarity of the images impressive, the content of the images are also, at times, quite breathtaking. Not much more needs to be said other than this is definitely worth a viewing. The soundtrack to this documentary is mainly dialogue as Professor Iain Stewart plays a geological version of a Sir David Attenborough. All other aspects of the soundtrack only add further dimensions to the imagery without detracting from it. The clarity of the soundtrack is excellent. 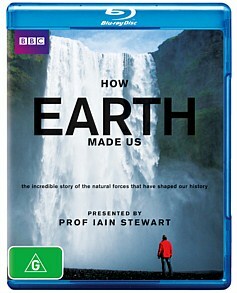 ‘How Earth Made Us’ is a documentary in a five part series on a double Blu Ray disc. It explains to the viewer how the three physical phenomena of geology, geography and climate converge to influence the distribution of human habitation on Earth. It uses an approach not unlike that used by sir David Attenborough but the core theme is that of geology rather that zoology. It is both entertaining and informative and it connects some of the dots to the distribution of human populations throughout history that a lot of people may not have connected. As such, this documentary is a very useful educational tool for viewing audiences.